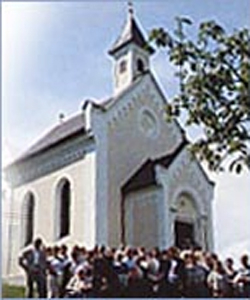 The Chapel at the Hamlet of Geisberg was built in 1901. The Chapel was founded by the Monastery of Pupping and is the destination of the annual Ascension Day Processions. What´s more, the lovely Chapel serves as perfect wedding church and is rated as one of the area´s most magnificent settings to tie the knot. Here's the our members favorite photos of "Churches in Austria". Upload your photo of Landerlkapelle Chapel!